A Crazy Canuck Living in Zany Italia! : Italy’s own version of the “Four Horsemen of the Apocalypse”! 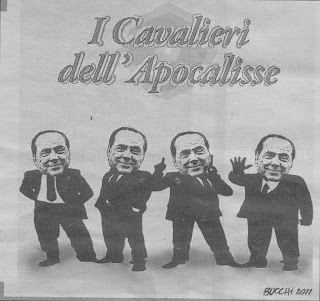 Italy’s own version of the “Four Horsemen of the Apocalypse”! Yes, the Italian version of the “Four Horsemen of the Apocalypse”, that is “Conquest”, “War”, “Famine” and “Death”. That good’ol Berlusconi, ALL rolled into one! It was 22 years ago today….